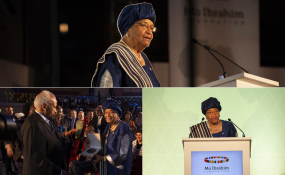 Ellen Johnson Sirleaf, the former President of Liberia, last night accepted the 2017 Ibrahim Prize for Achievement in African Leadership at a special Leadership Ceremony in Kigali, Rwanda. Today, the Ibrahim Forum will bring together experts from across Africa and the world to discuss ‘Public Service in Africa’ - its relation to good governance and effective leadership, its new challenges and current shortcomings, and the ways and means to strengthen it and make it appealing to the next generation. The weekend will conclude with a live concert featuring Sauti Sol, Peter P-Square, Riderman, Knowless, Phionah Mbabazi and Charly & Nina. Established in 2010, the Ibrahim Forum is an annual high-level discussion forum tackling issues of critical importance to Africa. The Forum convenes prominent African political and business leaders, representatives from civil society, multilateral and regional institutions as well as Africa’s major international partners to identify specific policy challenges and priorities for action. Previous Forums have dealt with: Africa at a Tipping Point (2017), African Urban Dynamics (2015), Africa in the next 50 years (2013), African Youth (2012), African Agriculture (2011) and African Regional Economic Integration (2010). Ellen Johnson Sirleaf served as Head of State of Liberia from 2006 to 2018. Ellen Johnson Sirleaf was awarded the 2017 Ibrahim Prize for Achievement in African Leadership for her exceptional and transformative leadership, in the face of unprecedented and renewed challenges, to lead Liberia’s recovery following many years of devastating civil war. The Ibrahim Leadership Fellowships form a selective programme designed to mentor future African leaders. Through this annual fellowship programme, we seek to deepen and broaden our growing network which continues to contribute its skills and learning to a better Africa. The Fellowships offer the opportunity to work in the executive offices of either the AfDB (Abidjan), UNECA (Addis Ababa) or the ITC (Geneva), with an annual stipend of $100,000. The Ibrahim Scholarships support aspiring African leaders at a number of distinguished academic institutions. The scholarships develop the talent of outstanding young Africans.